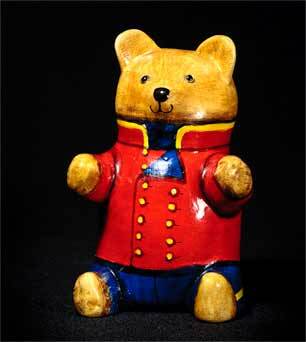 De Bethel soldier bear - 5⅛" (130 mm) high. He's either a soldier or a bandsman. Maybe both. Joan and David de Bethel started making papier maché cats and bears in 1960. They were intricately made and quite expensive - each piece took at least a day just to paint. David died in 1977 and Joan took up an idea that they had been tossing around before his death; she got Rye Pottery to supply soft biscuit fired models, and she painted them and returned them to the pottery for the glaze firing. Many failures ensued as the ceramic paint smudges easily when dry and this made successful transportation of the pieces difficult. Demand was high, and Joan had to go to Cinque Ports Pottery to augment the supply of bisque blanks. During a period of exceptionally high demand the Cinque Ports decorators had to help out by painting some pieces, and this led to Joan allowing Cinque Ports to produce their own models, very similar to hers. A change in the production technique followed. Instead of soft biscuit fired blanks Joan used hard fired biscuit and painted it with acrylic paint, finishing it off in marine varnish, eliminating the need for a further firing and the problem of smudging. Items marked with the Cinque Ports backstamp and From a design by Joan de Bethel are wholly the work of Cinque Ports Pottery. Those marked JB © Rye are painted by Joan and glazed and fired by Cinque Ports. The models marked Joan de Bethel or Joan and David de Bethel are hand-painted and cold glazed (marine varnished) by Joan. All the papier maché items, of course, however marked, were hand made and decorated by Joan. Following the demise of the Cinque Ports Pottery in July 2007 production of the blanks has moved to the David Sharp Pottery where Ben Sharp is carrying on with exactly the same arrangement that Joan had with Cinque Ports. There is a strong collectors' market for de Bethel pieces. The ceramic ones fetch good prices and the papier maché originals realize very high prices. For someone who has not handled both types it is difficult to tell the ceramic and the papier maché apart - the papier maché are very hard and quite heavy - it's quite simple though; the papier maché models are solid at the base and the pottery ones are hollow. Similarly the Cinque Ports pieces are easy to tell from de Bethel's by the mark on the base. The pottery cats come in different sizes, the largest being about 7 inches (178mm) high. Joan de Bethal has also been a designer for Rye Pottery, and is a respected painter of pictures.